« IGS revealing new games at GTI '08, will being releasing games in Latin America. ASI 2008 may have come and gone back in March but it’s still great when someone else shares their photos and thoughts on the the event, as Chris has done on his blog. He has some great pictures there and you’ll probably catch a few things that I didn’t put up in my ASI stuff. It sounds like he had a different experience with Primeval Hunt than I did – the guns worked out pretty well for me on the cabinet that I played it on (although I wasn’t crazy about the weight of the gun which after playing it for about a half hour starts to tire you). I didn’t play the air hockey table he has pictured but I did see it, it looks like fun. 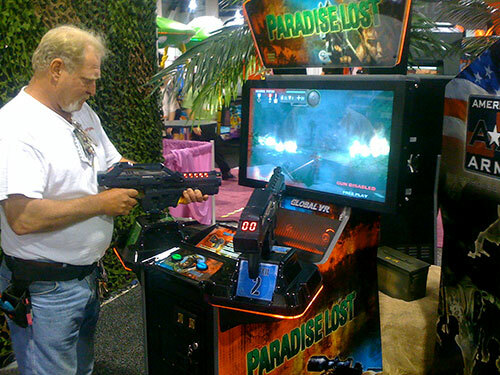 He also has a picture of Paradise Lost. I almost beat the game today while I was waiting to talk to the salesman at my distributor and I finally had enough time for it to figure out what it lacks – theatrical flare. The hero is just some guy on an island, the bosses aren’t given “theatrical time” where they could taunt you or show off some sort of evil personality and I hate how you get into a vehicle and instead of shooting things while you move, you go to a place, stop, shoot then move. Despite it’s flaws, I was told that the deluxe version is one of the best earning games on the arcade scene right now (I played the one pictured). Anyways, I’ll stop talking about it and let you check it out! This entry was posted on May 8, 2008 at 3:15 am and is filed under Arcade Games, Arcade Software, arcades, ASI, New games. You can subscribe via RSS 2.0 feed to this post's comments. Despite it’s flaws, I was told that the deluxe version is one of the best earning games on the arcade scene right now (I played the one pictured). Who exactly “told” you this. I rarely see this game on ANY top earnings lists and in the arcades I frequent Time Crisis and Ghost Squad are the top earners….. When I saw this game in Dave & Busters, all I could think was “PC with Far Cry” inside the cab, and felt sad for people spending money on it. I imagine most PC gamers will feel the same way and not play it. LOL…Dave, i had the same experience, i saw people playing the game and i felt pretty sad when i compare the game with the PC version, but around 3 weeks later i decide to give it a try but it was not that bad after all, is just that many arcade games are soo limited to fredoom compare to PC or Console games…….. I was told this by a distributor salesman who despises the game. He wasn’t trying to sell me on it; it may have been locally but he didn’t specify.